Review by AllTheBestFights.com: 2015-10-24, fight not particularly exciting between Norman Parke and Reza Madadi: it gets two stars. The black belt in judo and Tuf Lw winner Norman Parke entered this fight with a pro mma record of 20-4-1 (80% finishing rate) and he is ranked as the No.57 lightweight in the world. He has already fought twice in 2015 losing to Gleison Tibau (=Tibau vs Parke) and Francisco Trinaldo (=Trinaldo vs Parke). His opponent, Reza Madadi, has a record of 13-3-0 (69% finishing rate) but he is not ranked as he hasn’t fought since April 6, 2013 when he defeated Michael Johnson (=Johnson vs Madadi). 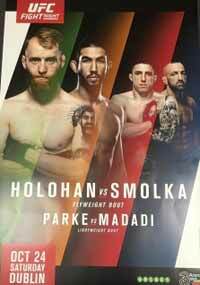 Parke vs Madadi is on the undercard of Patrick Holohan vs Louis Smolka – UFC Fight Night 76. Watch the video and rate this fight!